When I was a kid I lived for staying up late on Friday nights and watching the horror movies that were on then, like The Wolfman with Lon Chaney. It was one of the few things that tended to bring me out of my near- autistic world of otherwise incessant reading, and it was cool because horror movies were never as scary as my own imagination and what I read in books like Babi Yar or history books. There was one movie of the supernatural that really did make me afraid, it was called “Black Sunday” (no, not the one with Bruce Dern in the Blimp, even though that is much scarier nowadays…) After watching the moody Italian gothic film about a vampire witch resurrected after having a spiked mask pounded into her face I was so frightened that when I hopped into bed I used the side rail from the bunk bed to turn out the lightswitch by leaning far, far, over, and nearly falling out. I did that because I did not want to walk from the lightswitch to the bed in the dark. I laid there with the covers up to my chin and then heard a small scratching noise. Of course I had to look… and there in the closet was that face, that demonic mask, looking back at me. I could see the blank eye sockets, the shape, the grim mouth… it was indeed the most shocking thing I had encountered until that time, and I am certain that I was blanched and pale white. I laid there for five minutes, or so it seemed, paralyzed with fright. I was unwilling to call out, my father was in Viet Nam, and I sure didn’t want to call my mother in because that thing might get her or my sisters. Then it was that I decided that it could not be real. It hadn’t moved a twitch, and something inside me told me it could not exist. I had a long mental conversation to convince myself that it could not be. There was however only one way to know for certain. So sweating and pale I climbed out of the bunk bed, facing it the whole time, and walked up to the closet and put my hand on the mask I saw there. The shadow of my hand blotted it out a moment, and I felt the closet door smooth and wooden beneath my palm. I moved my hand again, and that mask distorted again. Then I followed the light back to my window where the moon was shining through the curtains – forming by weird happenstance a simulacra of the mask from the movie with light and shadow. I went back to the closet and looked closer – noting that the mask wasn’t perfect, that there were gaps and flaws. The knotholes in the pine pattern on the door that formed the eyes were lopsided. I couldn’t make myself see it as the mask again, even though my unbridled imagination seeded with a grim image from a chiarascurro film was able to fill the gaps and make the perfect image of that mask in my mind before I had touched it. That’s the night that I became a rational human being; someone who knew that the mind is both fallible and suggestible, and that knowing meant having the courage to challenge assumptions and perceptions through testing. A couple of notes: If you haven’t seen the movie I recommend it, it’s a classic horror movie that was certainly ahead of it’s time, and the cinematography is still a reference point for some. The moon photo above was shot this way because the normal telephoto moon shots I take wouldn’t work due to high thin clouds and wind. So instead you see tree branches in a long exposure blurred by that same wind. If you click on the thumbnail and view the large version you can see the traceries repeated. 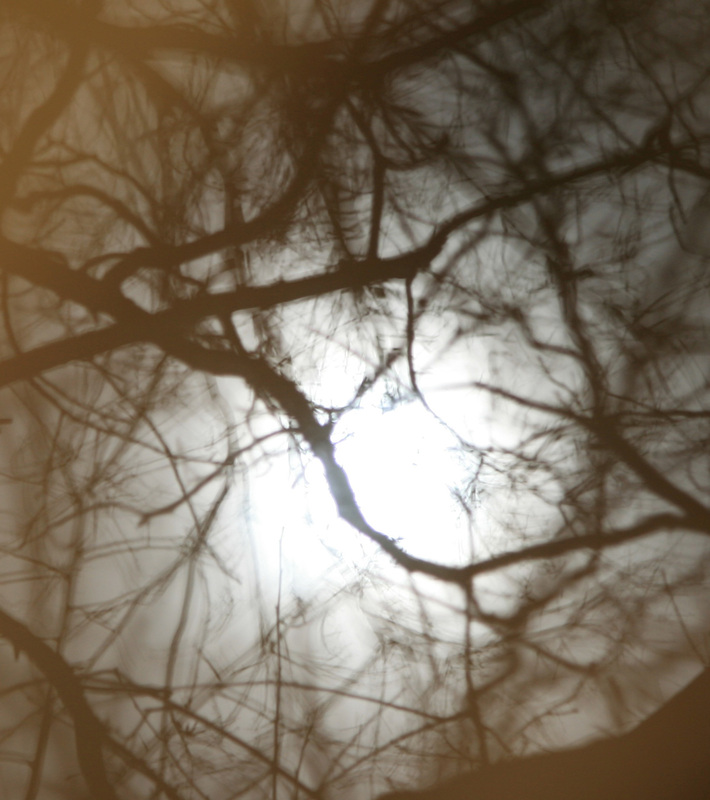 Synapses in moonlight. Oh, you ask about the scratching noise? That too I found. When I placed the rail for the bunk bed back after using it to flip the lightswitch, the paper/linen composite tag for my pillow was caught between the rail and the holder. When I moved my head it would move the tag, and the sound was amplified by the wood of the rail. Good story and better photo! Just shows the horrors the mind can cook up are usually greater than reality.